That’s the question I recently ran across on Facebook. By the way, if you’re not a part of a great teachers’ chat group on Facebook, you are missing a great opportunity to exchange ideas and encouragement. This question was posted in an incredible group called Encouraging Teachers. Christian Teachers’ Lounge, which is hosted by Teach 4 the Heart, is a group specifically for Christian teachers. 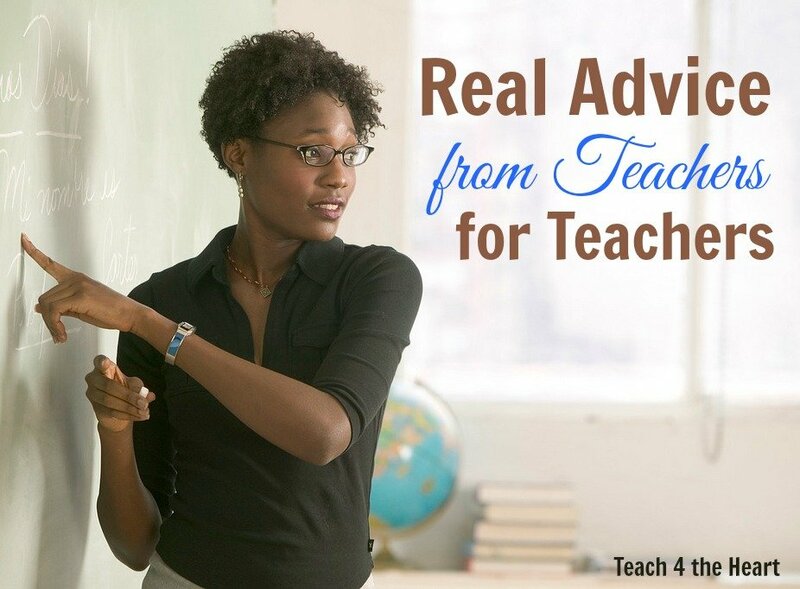 As I looked through the plethora of advice that was shared by this community of experienced teachers, I knew many more could benefit from hearing their thoughts.These are answers from real teachers who stand in front of students every day. It’s what you really need to know but what many colleges just aren’t teaching. Or for veteran teachers, it’s what we may already know but can sure use a reminder of. Take time to build classroom community. – Amanda H.
Try to stay as organized as possible. When you notice papers starting to pile up, take some time out of your busy schedule to get things back in order. You’ll thank yourself. – Susie Z. Never make assumptions about what students know or should know. Plan your lessons with room to back track….and room to stretch. – John B. They won’t care about what you know until they know how much you care. – Jennifer H.
Laugh with your students every day. – Brook P.
Teach with your heart. – Sharon G.
Find one joy in every single day. – Jourdan H.
Show your passion to your students. It is contagious! – Kelly E.
Be very nice to the secretary, janitors, and lunch ladies….your best allies. – Kim B. Make learning fun. – Jane T.
I love the book 32 Third Graders and One Class Bunny. Full of great advice! I read it when I was a student teacher, during my first year of teaching, and now. Each time, I have enjoyed it in a different way. – Lynnette C. [Yes, it’s a great idea to read teaching books each summer. For other great books, visit our Resources page. Keep a sense of humor. – Debra I. Be flexible and remember every class is different! What works one year may not work the next! Look into whole brain teaching. – Kim A. Enjoy each student! – Lisa T.
Evaluate yourself first and the students second. – Megan A.
Don’t lose who you are. Find balance. – Laura J. Remember what it’s like to be a teenager. – Cheryl M.
Make sure the kids know they are respected and cared for. – Amanda B. Remember you are making a difference in the lives of children! – Stephanie H.
Build a Tribe out of your class. – Mike R.
Start and end every single day with hope. Sometimes finding it is not so easy but it is always there. – Sue S.
Realize you will have good days and bad days. – Bethany M.
Laugh and pretend it is on the lesson plan. – Marla N.
Get plenty of sleep. It’s a necessity, not a luxury. – Emily E.
Never do for a child what they can do for themselves. – Ashley M.
Run a good race and finish it well. God did not bring us this far to fail us. Just do your best and God will do the rest. – Ellena C.
Save some of those precious notes of thank you from parents and students. On a bad day take them out and read them. – Barbara G.
Remember that you teach students, not a subject. Your job is to teach them how to learn and how to function as respectable members of society. Your content area is just your vehicle you will use to make that happen. – Kimberly Z. Stay organized from the very beginning. Keep as much as possible digital in files on your computer. Keep files on lessons or units covered in filing cabinets, in order. Then you can build upon these lessons the next few years. Write note to yourself about the lessons so you remember the following year what went well and what needed to be changed. – Wendy N.
What great advice! What about you? What’s the one piece of advice you would give to a new teacher? Share your advice by leaving a comment below. Want more advice? Get a free copy of our e-book 101 Teaching Tips. Join an online PLN through Twitter! #MTBoS for math teachers of all levels! I truly learn a lot from all of you guys. .. Thank you for everything ..
Sprinkle little life wisdoms into conversations with students whenever possible. They will love you for that and be fascinated. When an obstacle shows up, be light and funny as you solve the problem. This sets a great example for your peanut gallery that drama is just drama. Sing with your class, not just to have them sing, but to help them find their “voices.” As often as possible, hand out hugs.